Southeast Asian countries have a long and distinctive history with the practice of crafts. Our rich cornucopia of natural resources has inspired local handicraft work to be embedded in the daily use of traditional cultures. Time Lapse is a collection of utensils and tableware sets for traditional sweets in Kuching, Sarawak. This inspiration comes from Borneo's cultural diversity both past and present. Various materials can be combined together with lacquer to create a new perspective and a unique beauty in new objects. The story behind all materials represents the way of life in this region and are both artistic and functional objects made for daily use. 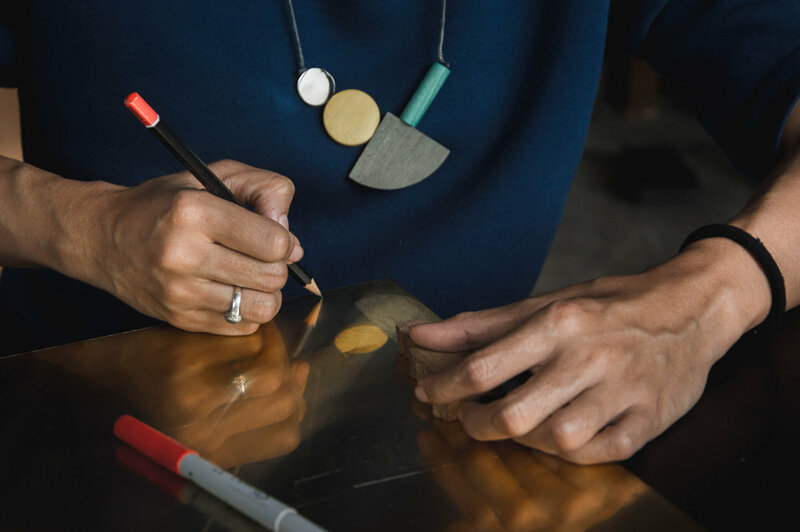 Our creative work does not aim to design or produce new products but rather to explore the possibility of local techniques and materials which can be combined with natural lacquer. The main idea is to collage local materials which can be found in Sarawak. First Collection : Broken Ceramics found in Kuching employ the Kintsugi technique to provide new life to broken old ceramics in different shapes and forms. Second Collection : Belian wood (scrap wood) and tree bark combined with broken ceramics presents two different materials from the forest to town. Third Collection : Rattan (side table) and Tin tray the contrast of local and industrial materials and the skill of local artisans in town and at the border line. *Additional: sweet utensils using Brass and Belian wood. 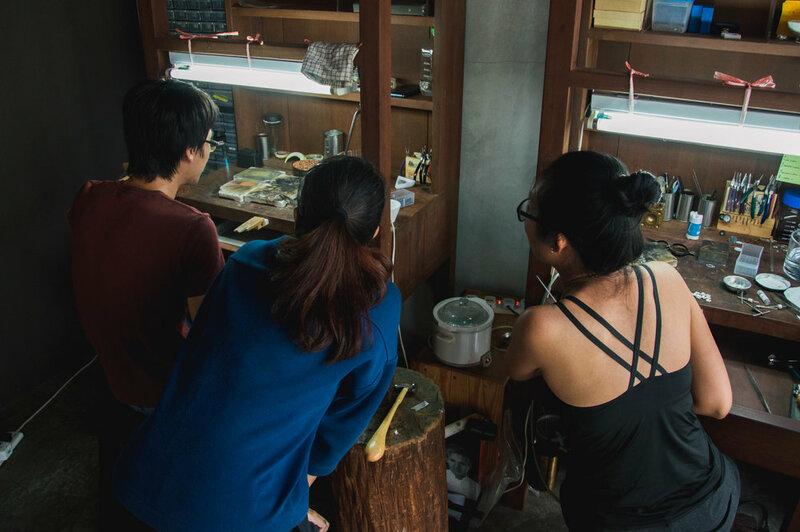 Left and Right Artisan : Brainstorming and background research of Sarawak traditional sweets and collaboration of metalsmith work for sweet utensils. Stanley’s Factory : Scrap Belian woods. Serikin Rattan craftman : Rattan ( side table) production. Ho Nyen Foh : Tin tray for Rattan table.